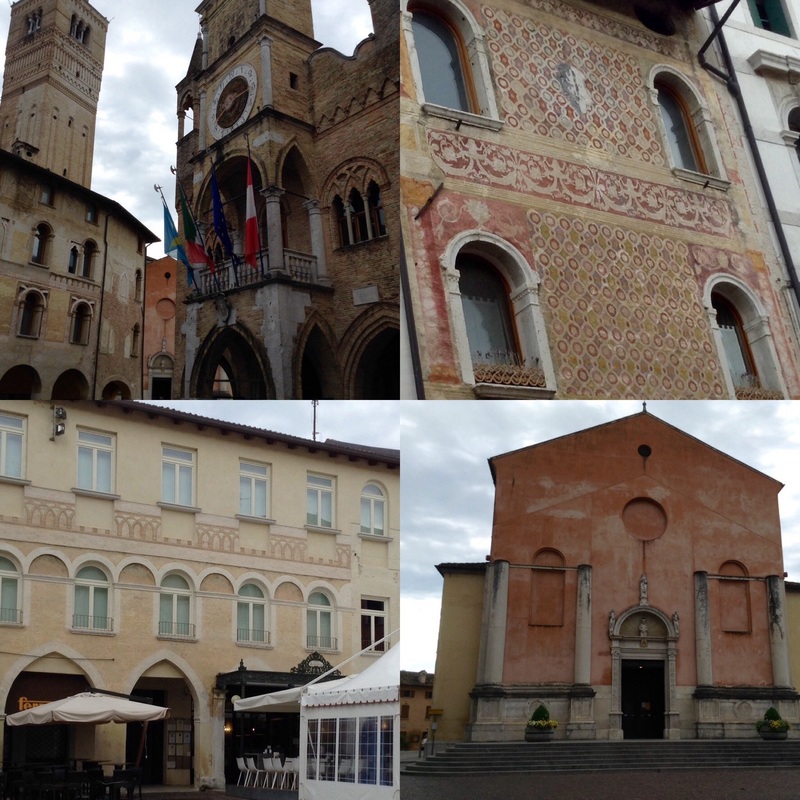 We kicked off our Giro adverture in NE Italy, staying in Pordenone, which has a beautiful Old Town surrounded by a river and plenty of greenery. 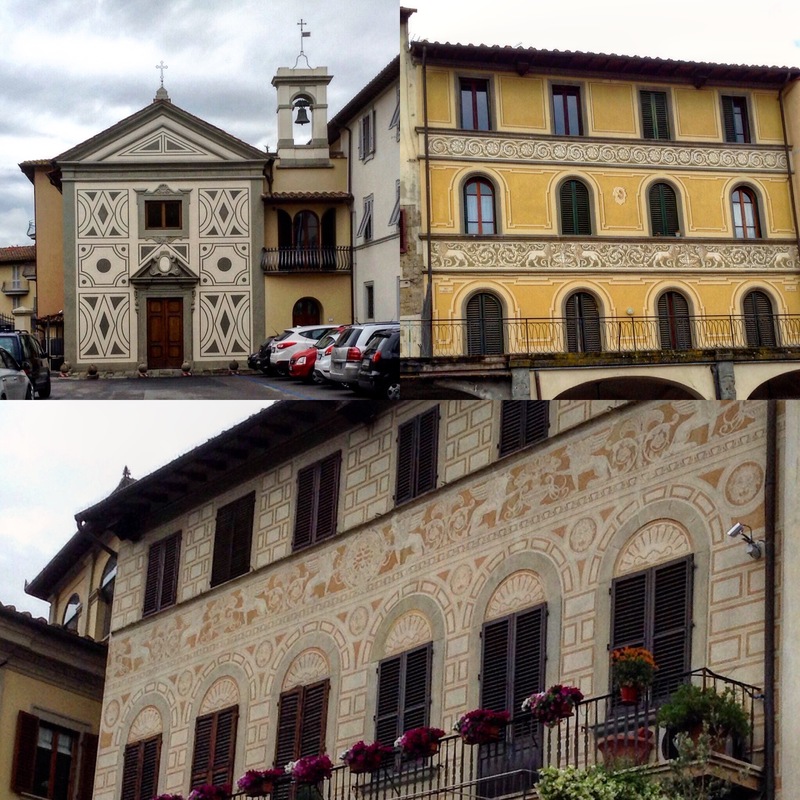 It’s a place and area we both know well as my beloved has clients here and I have a dear friend living nearby in Asolo. It’s our first visit since the Giro 2016 and we’ve enjoyed visiting old haunts and finding new ones. 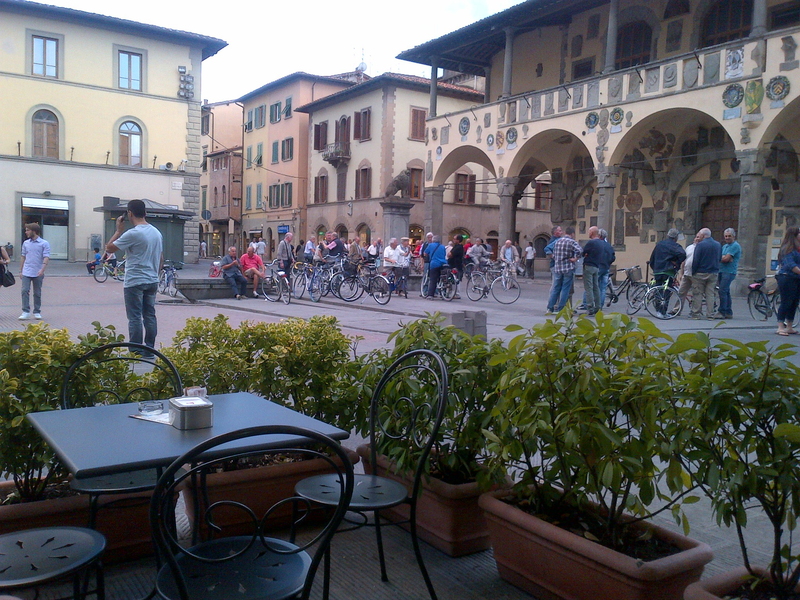 Conveniently we arrived at Apero’clock and headed straight into the bar opposite the hotel for an Aperol Spritz. It was superior to those we’d recently drunk in Paris. We’re beginning to think that they’re like coffee, better and cheaper in Italy. It was easily as good as the one I recently drank at the Carlton in Cannes which was 10 times the price! I’d elected to dine in my favourite restaurant but “shock, horror” we found it was closed and undergoing renovation. So we went to my second favourite. We fortunately arrived there ahead of a large party who’d laid on some entertainment, a chap at an organ singing. It was truly dreadful and we were grateful we were seated at the other end of the restaurant. The dog on the table next to us started howling, whether in protest or to drown out the singing I have no idea but………In any event, dinner was delicious and we quickly departed for an early night. Next morning we headed to our first stage – no 13, unlucky for some – from Ferrarra to Nervesa della Battaglia. 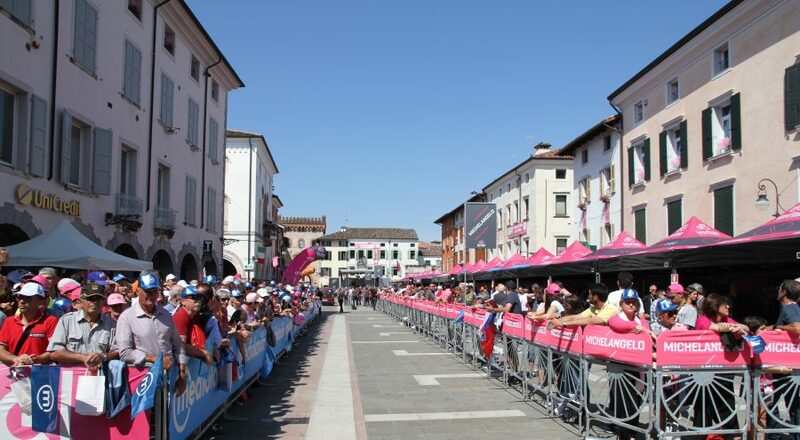 The finish town was in Prosecco country, so hopes were high that it would be one of those delightful historic towns with plenty of Baroque architecture set around a chaming town square lined with cafes, bars and restaurants. Sadly, our hopes were cruelly dashed. The finish town had absolutely nothing to commend it. The locals had done their best, festooning it with pink flowers, bunting and balloons. 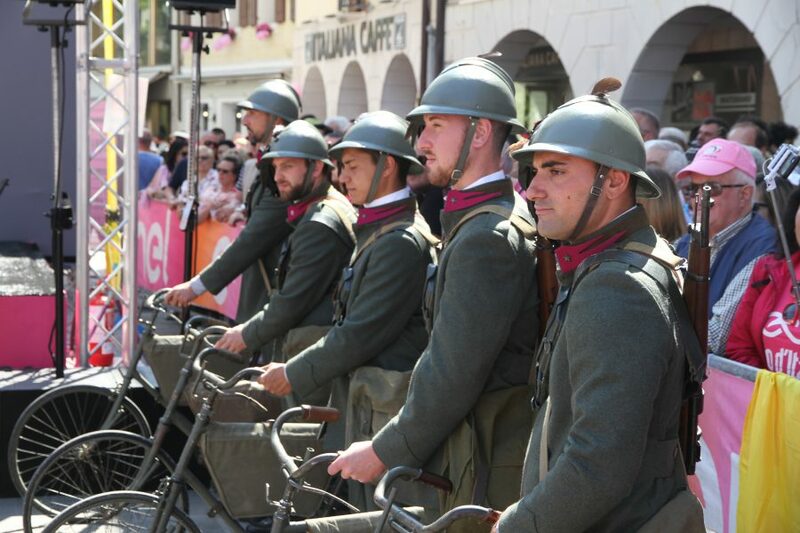 Its claim to fame is only as the site of an important WWI battle – the Giro was celebrating 100 years since it ended. Otherwise, the town is totally unremarkable. After a quick walk around town, we ate at the only place serving meals rather than just panini. Chaos reigned within. We waited 40 mins for a drink, a further 20 mins for our starter and, after another 75 minutes, gave up on our main course. However, I do believe one of the members of staff may have provided Julie Walters with inspiration for Mrs Overall. Though even she melted when ladies’ fave Bernie Eisel sat down at the next table with the Eurosport crew. She served them in record time! Though, to be fair, the restaurant was now practically empty. It took me a further 15 minutes to pay and even that was only thanks to the timely intervention of the Rai crew. On the upside, a local producer of Prosecco distributed bottles of same in the press room so we picked up one each – result. The race passed through the town once before the finish on what was a rare day for the sprinters, ahead of Saturday’s fearsome stage to Monte Zoncolan. The last of the four-man break was sucked back in within sight of the line and Elia Viviani (Quick-Step Floors) took his third stage, tightening his grip on the puce jersey – a colour, I should add, that suits no one, at any time, anywhere. See what I mean about the colour? We hung back to watch Alessandro di Stefano’s Rai TV show Processo alla Tappa (After the Stage). A consummate professional from her finger tips to her toes, she asks all the right questions and rapidly summarises the key points. Sadly we missed Apero’clock due to the huge traffic jam as everyone fled the town. Once back at base, we ate at one of the newer restaurants in town which has now gone on “The List”. Dessert was an ice cream from the shop in the town square which is owned by a former professional cyclist who still looks pretty trim. He obviously doesn’t over-indulge on his products. 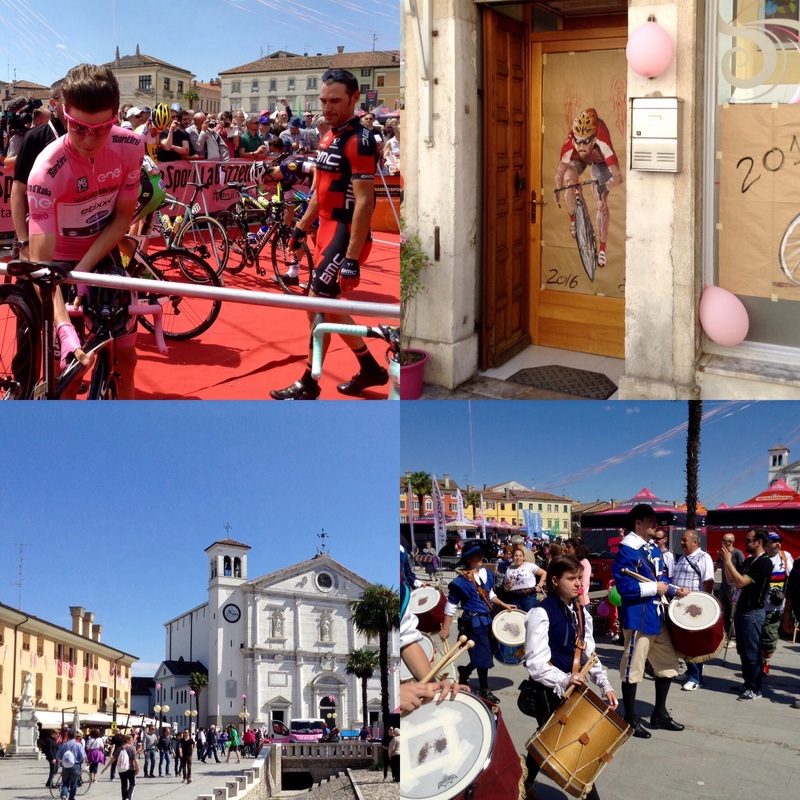 The stage start on Saturday in San Vito al Tagliamento was just down the road from where we were staying. I hung around the buses to drop off some cakes that I’m sure would be appreciated after the day’s tough stage which finished on the iconic Monte Zoncolan. It took me a while to locate everyone, as the parking was so disorganised. As usual the space allocated for the buses was far too small so they were spread all over the place. 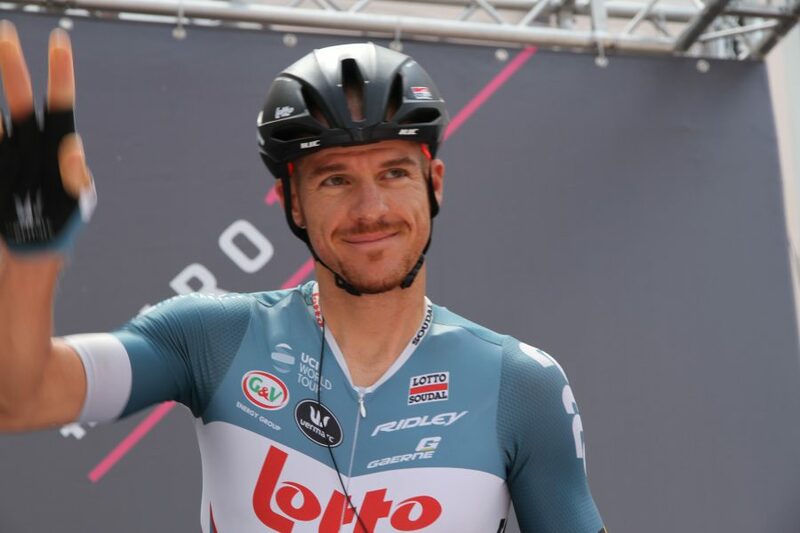 20 consecutive Grand Tours for Adam Hansen and he’s still smiling! 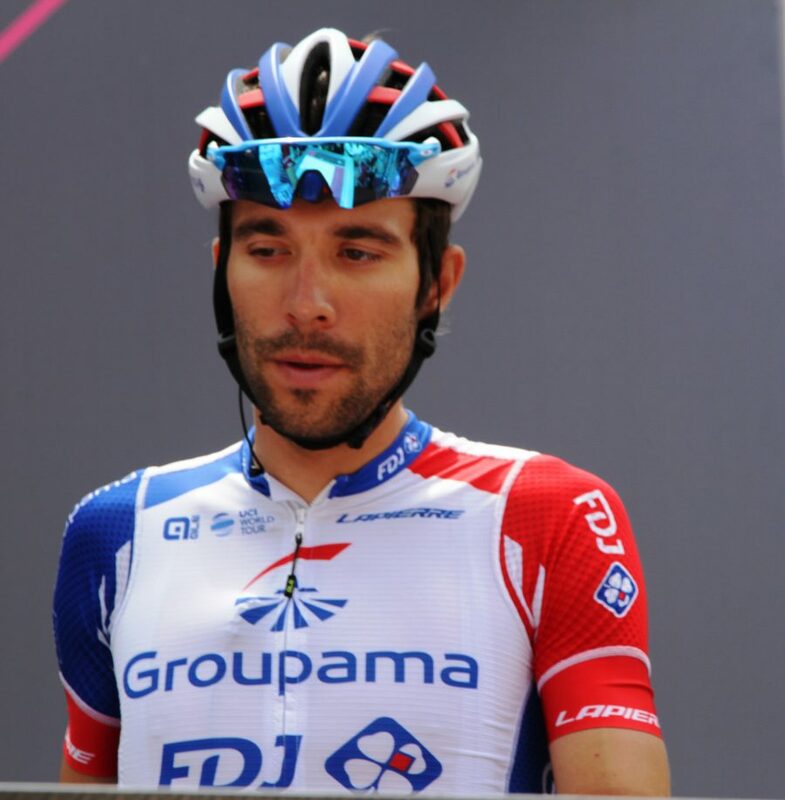 Thibaut Pinot: Is Tibbles now the French housewives favourite? Again, Sunday’s start stage of Tolmezzo was not too far away though closer to the Austrian border. It was yet another charming Italian town albeit one with an Alpine feel. Unfortunately, the shops were open and I spotted a lovely handbag that I just had to acquire! If only the organisers had given me access to the sign-on, this would never have happened. Again, to avoid the traffic, we watched the stage conclusion on the television even though the finish town wasn’t too far away. Consequently, we were around for the all important aperotivo which preceeded a trip to our favourite pizza joint. We spent Monday’s rest day in Ljubljana before heading to Lake Garda where we spent two nights at the same hotel we stayed in en route to Seefeld at Christmas. You can read all about it in part II. 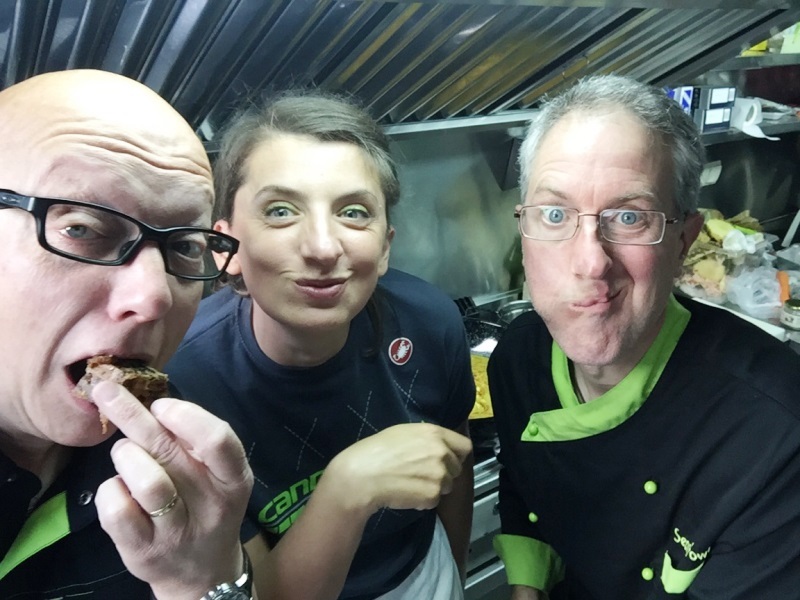 This past week-end, we went back to Italy to watch a couple more stages of 100th Giro d’Italia and deliver some of my brownies and vegan banana bread (recipe coming soon) to a few of the teams. Storms were forecast on Friday and my beloved was keen to finish off some work before we left for stage 13’s finish in Tortona. A place we’ve often seen sign-posted on the motorway but have never visited. My beloved is a terrible passenger seat driver (there’s no back seat in the Smart) which is why I typically allow him to drive however he currently finds driving my car too painful, so I’m in the driving seat. Of course, that doesn’t stop him from telling me how to drive, forever startling me with shouts of “watch out he’s braking” or “get over, he’s coming out”. I’m startled because I’ve been concentrating on the job in hand. Yes, I’d spotted the red brake lights and no the lorry’s not coming out, merely signalling his intention to do so once I’ve passed. Frankly, if he doesn’t shut up he’s going to suffer the same fate as his missing crutch! Sadly we arrived too late to get into Tortona to watch the finish. However what we could see as we drove around it and onto our B&B for the night looked promising. We were staying in a small farming community not far from the finish of Friday’s stage and the start of Saturday’s. Our studio room was a beautiful hayloft conversion and our hostess had thought of everything. It was charming. Furthermore, the bed was comfortable, the towels were where they should be – in the bathroom rather than artfully piled on the bed, a pet peeve of mine. She’d even left us aperos and nibbles which we enjoyed while watching the end of the stage. Fernando Gaviria (Quick-Step Floors) picked up his fourth stage win, not bad for his maiden Grand Tour! We decided to eat dinner in the only restaurant in town, a bustling family one which was serving an all you can eat special Giro menu. My beloved could only manage one pizza! Mind you before that he had some delicious stuffed farinata and finished with strawberries and ice cream. I blew the budget with a mixed salad and marinara pizza that I struggled to finish for Euros 7. This was an uncharacteristically cheap night! Back at base, the WiFi was excellent and I drifted off to sleep missing the second half of Versailles! We were woken at 8 o’clock by the nearby church bells and enjoyed a copious breakfast before heading to Castellania, former home and final resting place of Italian cycling god Fausto Coppi. We were the wrong side of the village to get to the PPO without which we couldn’t get to the press parking. We ditched the car, grabbed some of the cakes and started walking the 3km to the village. This was to be my beloved’s longest walk for three months and he managed just fine. According to the Giro road book, the buses were parking some 1500m from the start, which meant I was looking at walking another 3km. Once we reached the village, I couldn’t see any signs and asked one of the many Giro staff where the buses were parked. He told me 10km away in Tortona. I thought he was joking, he wasn’t. I was beginning to regret having lugged some of the cakes with me. Luck was on my side. I bumped into Laura Meseguer, one of the hardest working journalists I know and certainly one of the nicest, and prettiest. She explained that the Eurosport crew were just about to head to the buses and she’d be happy to take my cakes and distribute them for me. She noted down the names of the lucky recipients, took the cakes and shot off. The crowds were suitably large, I admired the various homages to the Coppi bros, while my beloved took photos and we lunched on delicious home-made focaccia before trekking 3km back to the car. 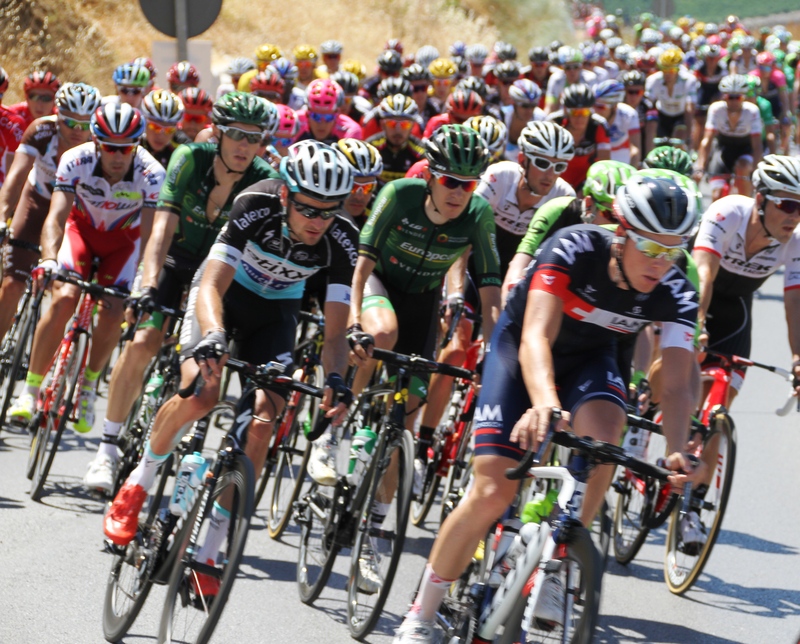 With a stage of only 130km, we stood no chance of making the finish before the riders. We stopped en route to fill up the car, and us, and watched the last 45km on the television. The result was unexpected with the current race leader Tom Dumoulin (Sunweb) getting the better of race favourite Nairo Quintana (Movistar) on a summit finish. 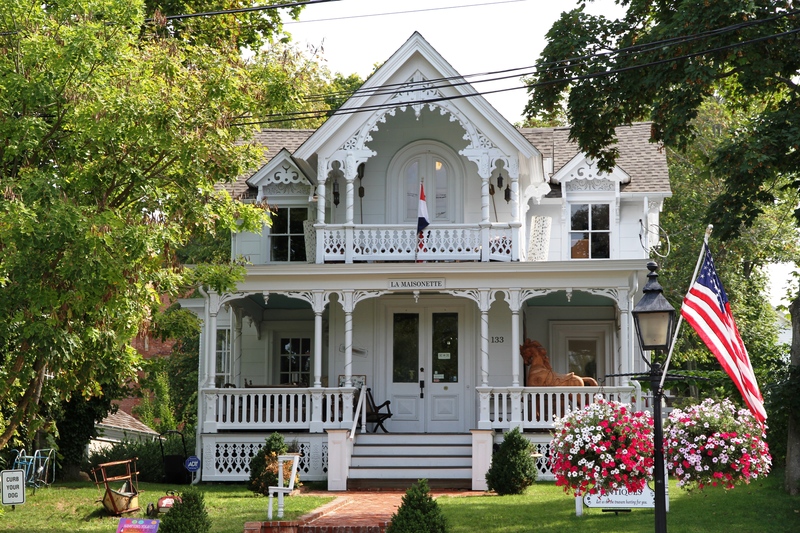 We drove to our next B&B, not too far from the finish, in a leafy suburb. It was yet another house where empty nesters had turned their excess space into guest accommodation. We settled in before heading back out in search of dinner. To be honest, it didn’t looking promising. There were loads of Bars and Gelaterias, but no restaurants. Finally we spotted a hotel restaurant advertising Tex-Mex Pizzas. Concerned that this might be a fusion step too far, we nevertheless ventured inside to discover a busy, bustling family restaurant thankfully serving Pizzas and Tex Mex. Our dinner was interrupted twice by my car alarm going off. No reason why, but I’m even more convinced this was the cause of my recent flat battery. Replete with spicy Tex-Mex, we dove back to our overnight stay and a good night’s sleep. We breakfasted early and headed to the start in nearby Valdengo. Bizarrely, the stage started close by the town’s churchyard with a number of the buses parking up in its car park. 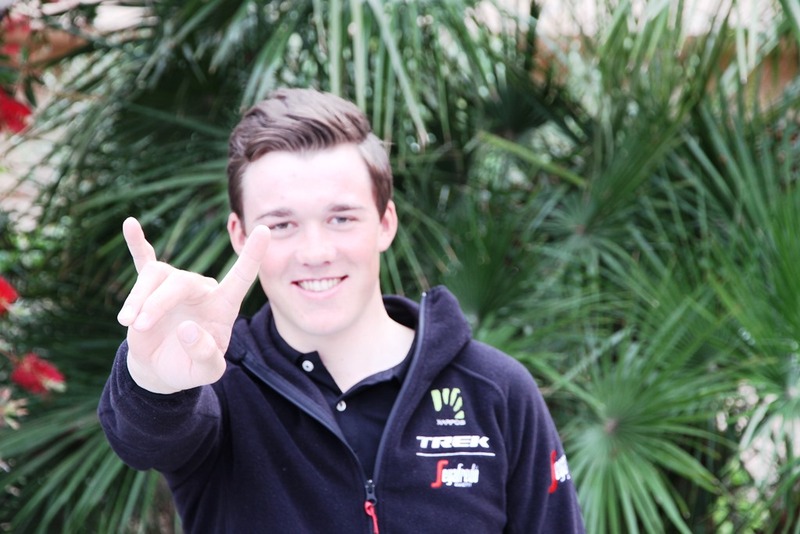 I had the rest of my cakes to deliver and wanted to catch up with Trek-Segafredo’s youngster Mads Pedersen. 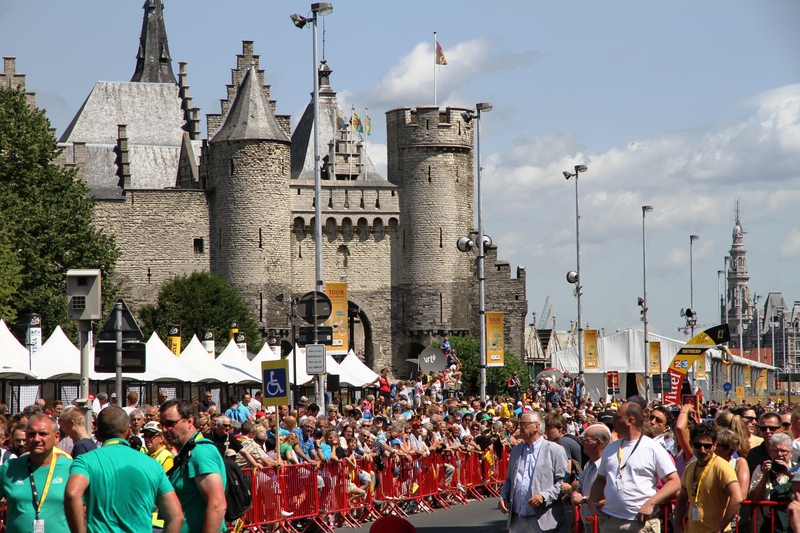 Mission accomplished, the peloton headed in one direction – and a mad dash stage won by Bob Jungels (Quick-Step Floors) – and we pointed the car in the direction of home. As we drove towards the motorway junction, my beloved suggested we stopped for lunch. We spotted a sign-post for a restaurant off the main road. It looked fairly unprepossessing but there were a number of large expensive cars parked outside. Inside we found my default white linen tablecloths and napkins and luckily a vacant table for two. We enjoyed a magnificent seafood lunch and set off with smiles on our faces as we sped back to our home in France. 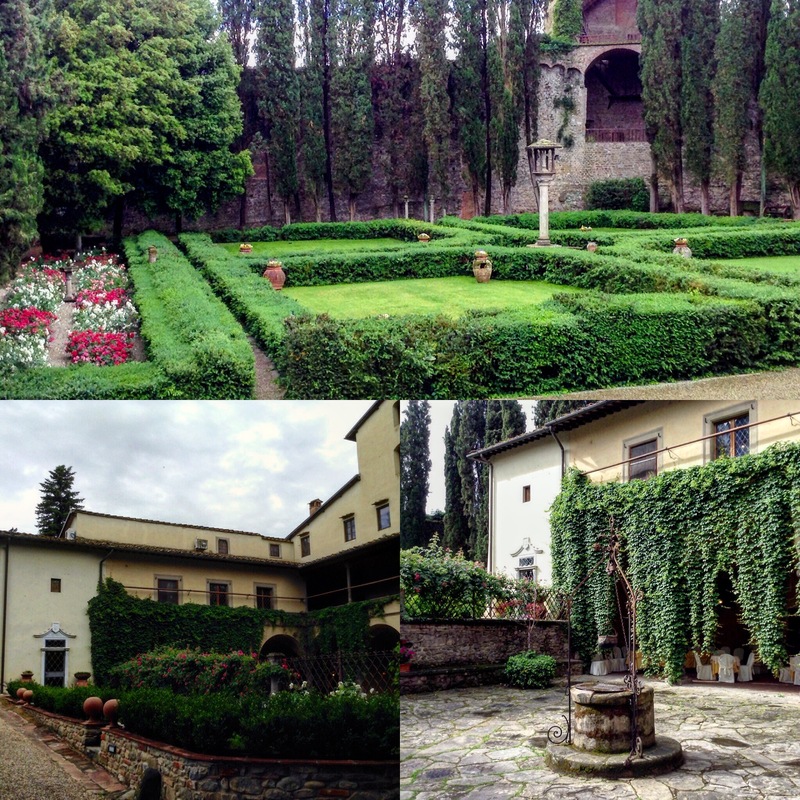 We’d had an excellent week-end in Piedmont, a place we should visit more often. The countryside is charming, quieter but no less picturesque than Tuscany, plus its hotels and restaurants represent great value. 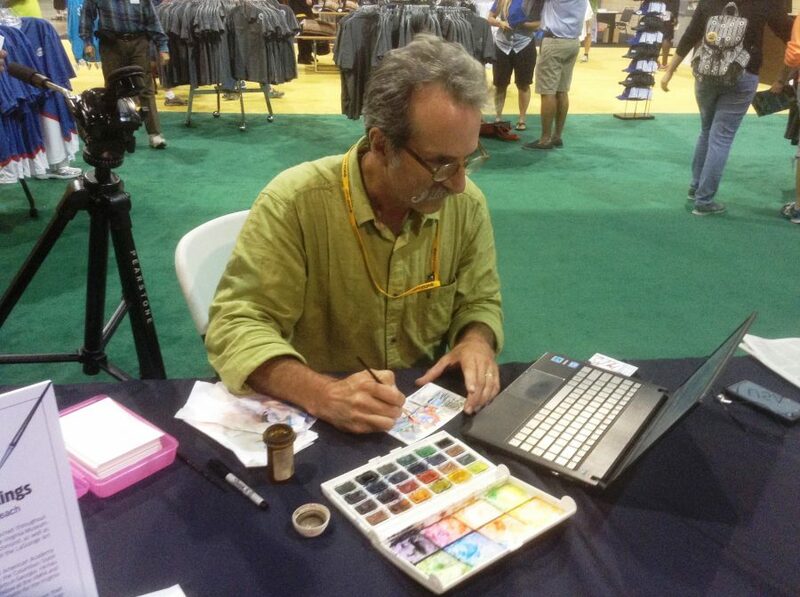 American cycling artist Greig Leach and I are working together again. 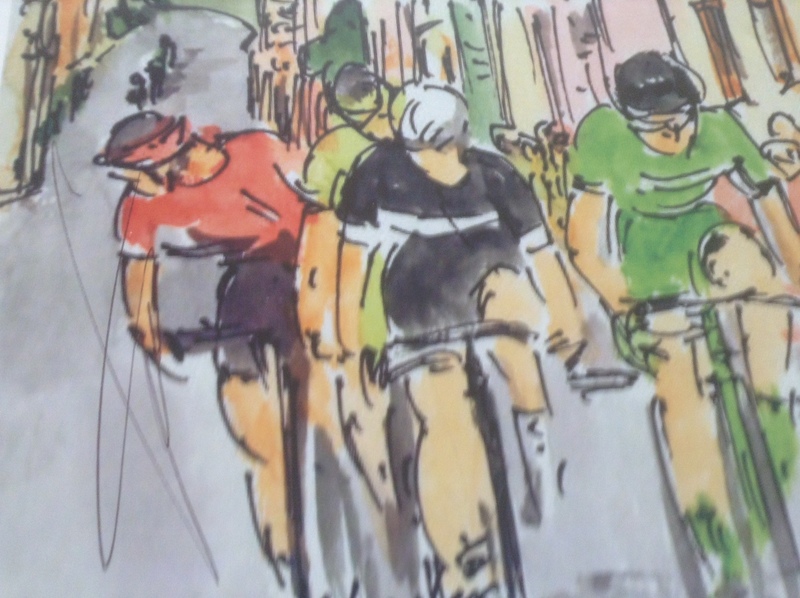 Greig’s planning on producing a hardback book of his vibrant postcard sized pen and water colour paintings of each of the stages of this year’s 100th Giro d’Italia, complete with his narrative – which I’ll be editing – stage profiles, stage winners and jersey wearers. Now’s your chance to pre-order this magnificent memento of what’s already shaping up to be an epic edition of the Giro as it wends its way from Sardinia to Sicily, and the length and breadth of mainland Italy. The first ten days or so has been super exciting and it’s only going to build to a crescendo in the final week. You can “try before you buy” as the work and accompanying (unedited) narrative appear daily on his blog, plus he regularly posts his work on Facebook and Twitter. This is a Kickstarter project, so if you would like to support Greig, check out the campaign page. Contributions start very small at just US$1, but you have to commit at least US$40 for an artist signed copy of the book (with worldwide delivery) plus assorted goodies. 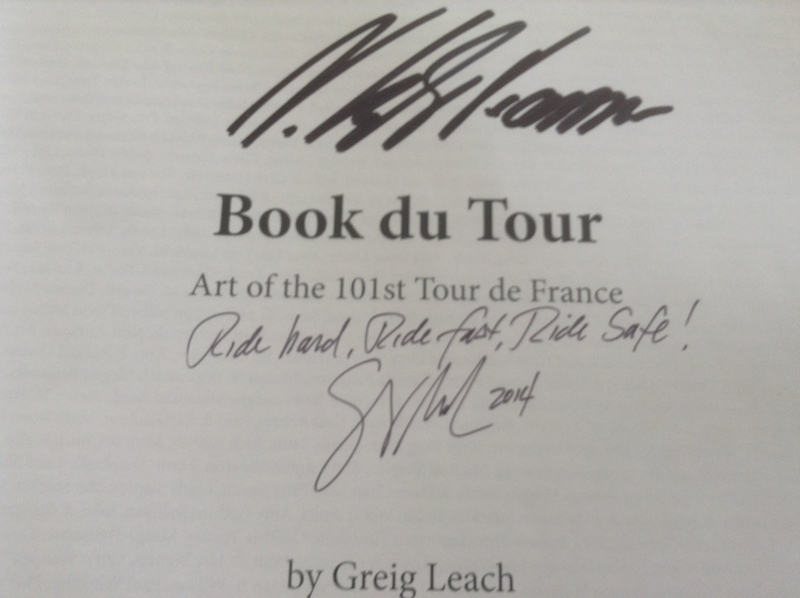 Splash the cash and pledge a whopping US$ 500 and your book will also be signed by the winner of this year’s 100th Giro d’Italia. No prizes for guessing who’ll be collecting that all important signature once the book is published. 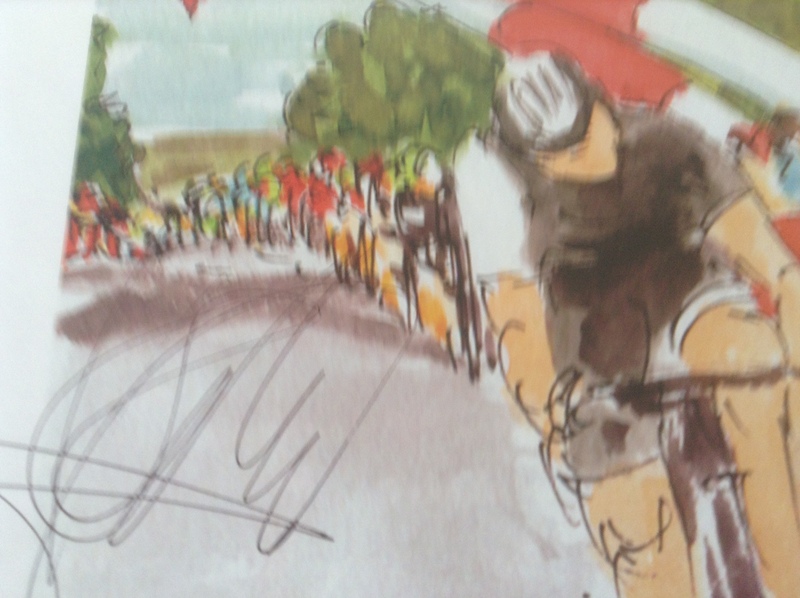 Of course, you can also buy Greig’s original postcard sized drawings of this year’s races (and indeed from many other races), but you’ll need to be quick. It’s a case of first come, first served! 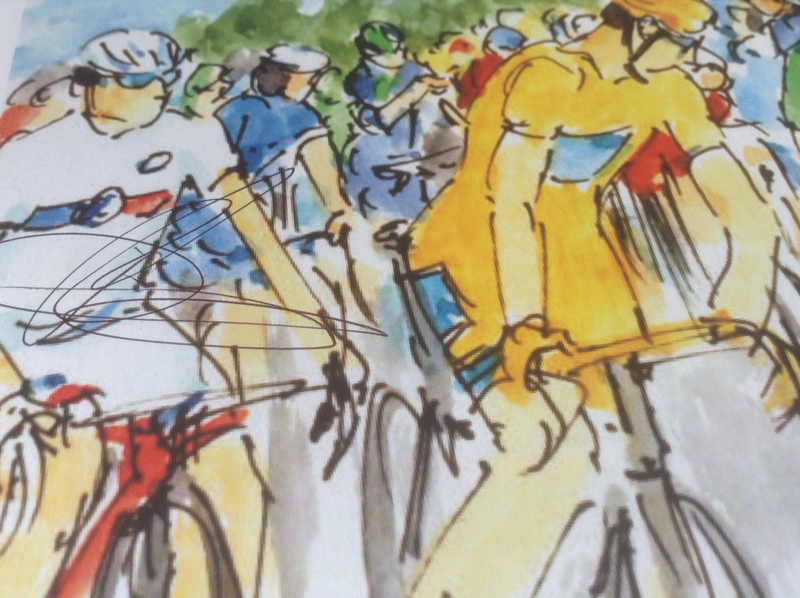 These, and indeed the book, would make wonderful presents for the cycling enthusiast(s) in your life. Or why not treat yourself to a reminder of what’s sure to be a very memorable grand tour? If you want to know more about Greig, please check out my interview with him! 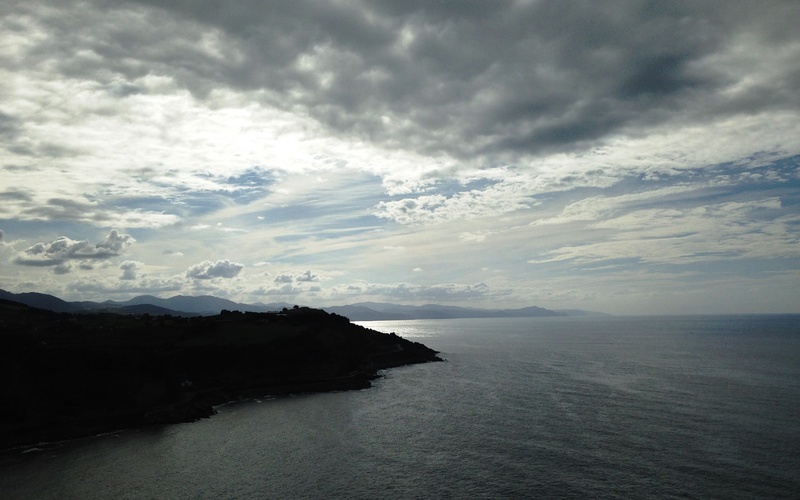 We spent last week on our maiden trip to Sardinia ostensibly to watch the first three stages of the 100th Giro d’Italia but also to see something of the island. 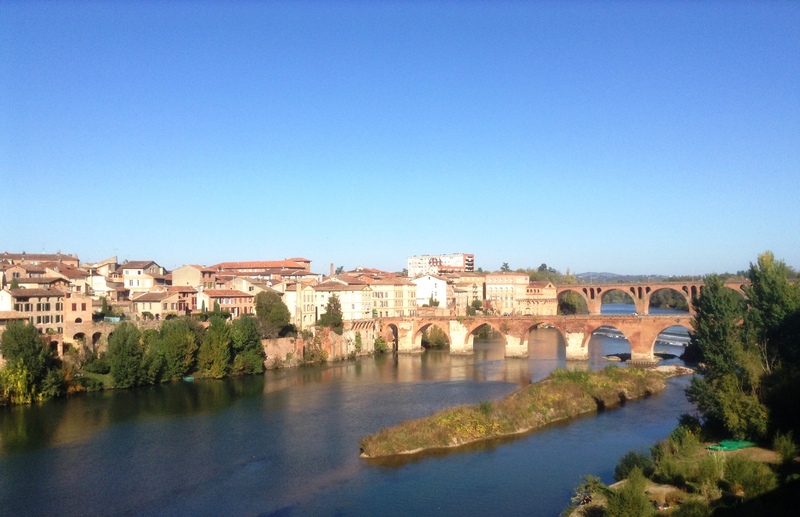 We toyed with going by ferry but in the end plumped for direct flights from Milan and a hire car – quicker and cheaper. I drove to Malpensa on Sunday evening where we stayed overnight in a delightful B&B with a magnificent garden and red-hot WiFi. We dined in the local town in a restaurant that greatly exceeded expectations. Luckily we were the first to arrive as it was packed with locals – a ringing endorsement – by the time we left. This got our holiday off to a real swing. 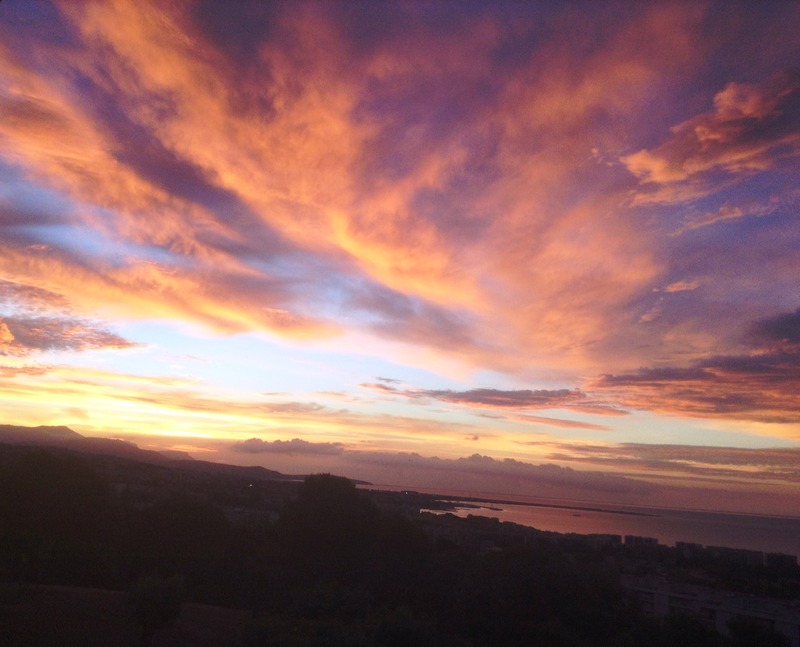 The following morning it was pouring down as I drove to Malpensa and our EasyJet flight to Alghero, on the north-west coast, which was hosting “The Big Depart”. Even before we’d left the airport to collect our chubby Fiat 500L, it was obvious the Giro was in town. We drove straight to our hotel on the outskirts of Alghero, nestling in the verdant countryside, dropped off the luggage and drove back into town for lunch. An octopus salad later – you know how I love my cephalopods – and we were ready for a walk around the charming old town. By now the sun was out and it was starting to heat up but we were still huddled in our gilets on account of the brisk sea breeze. I was on the lookout for potential dining spots as we were staying here for four nights before heading with the peloton to Olbia on the other side of the island. There were plenty to choose from, all sporting my default white (or pink) linen tablecloths and napkins. I spotted two old boys shooting the breeze speaking a language I didn’t quite understand but it sounded most like Spanish, and then the red and yellow Catalan flag was flying prominently from a number of buildings. Turns out, a part of its population is of Catalan descent. Back in the Middle Ages Sardinia was part of Aragon. 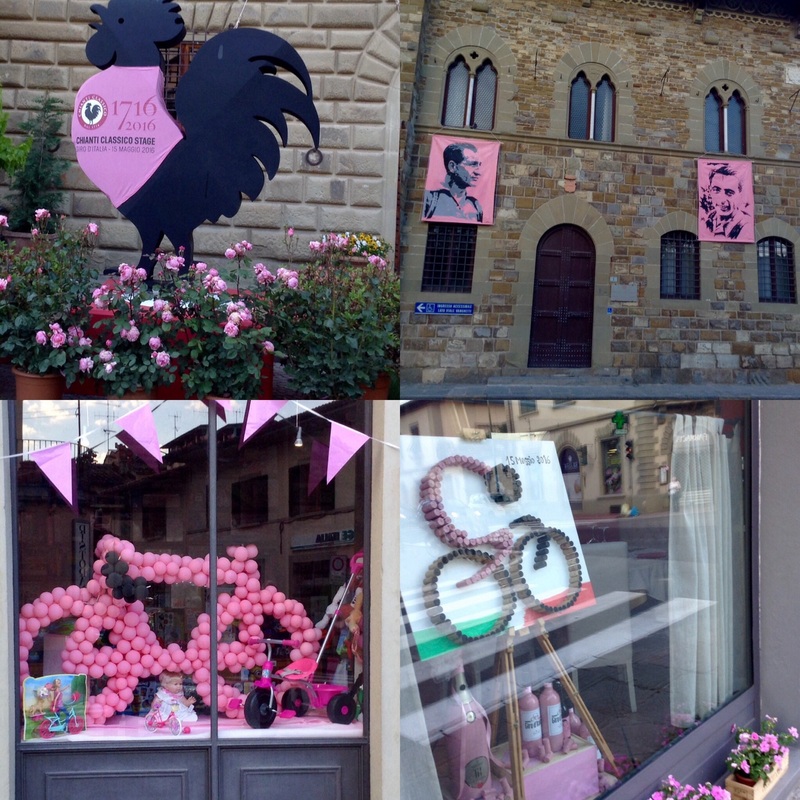 The town was already bedecked in pink: pink flowers, pink bikes, pink bunting and balloons, pink cycling-related displays in shop windows. You knew the Giro was coming to town. Of course, the party atmosphere was largely due to it being 1 May and a bank holiday pretty much everywhere in Europe. After unpacking and exploring our hotel, we opted for a light snack and a couple of Aperol Spritzes for dinner – shades of our recent stay in Alassio. Breakfast the following morning was copious. I particularly enjoyed all the vegan options. I should add that at many Italian motorway service stations it’s now possible to get vegan croissants! I’m not allowed them as they’re made with soy but even so…mille grazie. We spent the morning working before heading into town for lunch – more squid – and picking up our accreditations, a relatively speedy affair this year. It helps to be first in the queue. The afternoon was spent working around the pool with my beloved undertaking some of his exercises in the water. We opted for another light dinner, this time courtesy of the local Lidl before watching an action movie in Italian with me providing my beloved with a running commentary in English. Wednesday we woke to birdsong, sunshine and clear blue skies. With almost all the teams billeted out of town we decided to forgo the inevitable round of pre-race press conferences in favour of a morning working, followed by lunch in a nearby town en route to the Trek-Segafredo presser. Well, I’ve got to show up at least one of them! 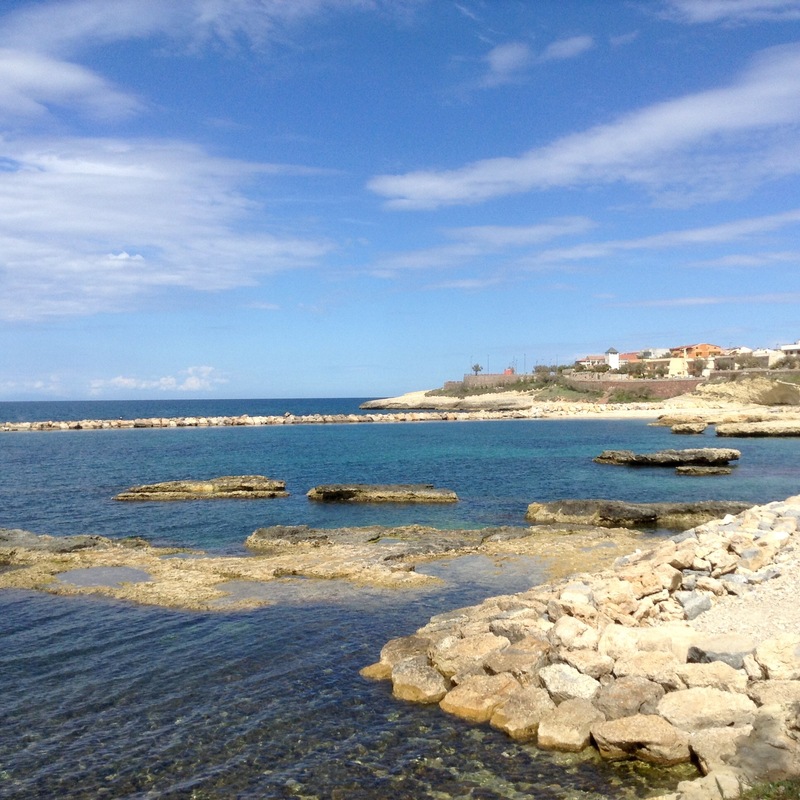 We had a seafood lunch in Porto Torres, where the ginormous ferries from Genoa and Toulon dock, before driving back into Sassari, the closest major town, to buy a memory card so my beloved could take some photographs. One of these days he’ll actually check he has everything he needs before we leave for a trip! The team, along with many others, were staying in a hotel in Stintino, near to a national park on one of Sardinia’s most northerly points. There were surprisingly few journalists and I got my pick of the team. I plumped for neo-pro Mads Petersen, the almost benjamin of the Giro. He has a surprisingly mature head on very young shoulders. I’ve a feeling he’ll go far. We drove back cross-country, marvelling at the open spaces and beautiful countryside dotted with sheep, goats and cattle, plus plenty of olive trees and vines amid bright bursts of yellow broom. As we passed through La Corte we noticed many of the roads were named after former Italian champions: Coppi, Bartali, Binda, Giradenga. In Alghero there’s a church and road named Valverde, remnants of its Catalan past rather than in deference to Alejandro Valverde, a Murcian pro cyclist with Movistar. With the sun now firmly over Sardinia, Thursday followed a similar vein. We worked in the morning, headed into town for a late lunch and a spot of shopping. Alghero is famous for its coral and I’ve long wanted a coral necklace to match a beautiful coral ring my parents bought me over 30 years ago in Capri. I had treated myself to matching earrings in Como but I’ve never gotten around to completing the set until now. At my time of life, it’s definitely now or never! 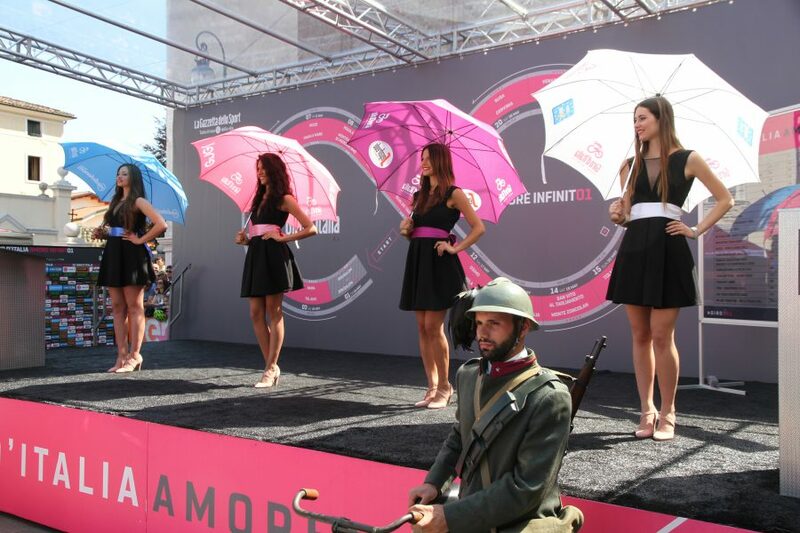 The team presentation was well attended and paid homage to the Giro’s illustrious past and present. We watched from a distance. A press scrum is no place for a man on crutches. On Friday, the town was pumping. Folks had obviously come from far and wide, many decked out in pink, particularly the kids who all seemed to have pink whistles. Great for the atmosphere but no doubt parents would be cursing them later in the day. The race set off amid much fanfare, Astana at the head of proceedings in memory of the recently departed, much admired Michele Scarponi. Having said a quick hello to those riders we know, it was back to the car and off to the other side of the island to watch the finish in Olbia, a town close to the world-famous, ritzy resort of Costa Smeralda. It was only as I was skimming through my beloved’s cycling photographs that I realised how many featured the lovely leggy podium girls who grace every event! 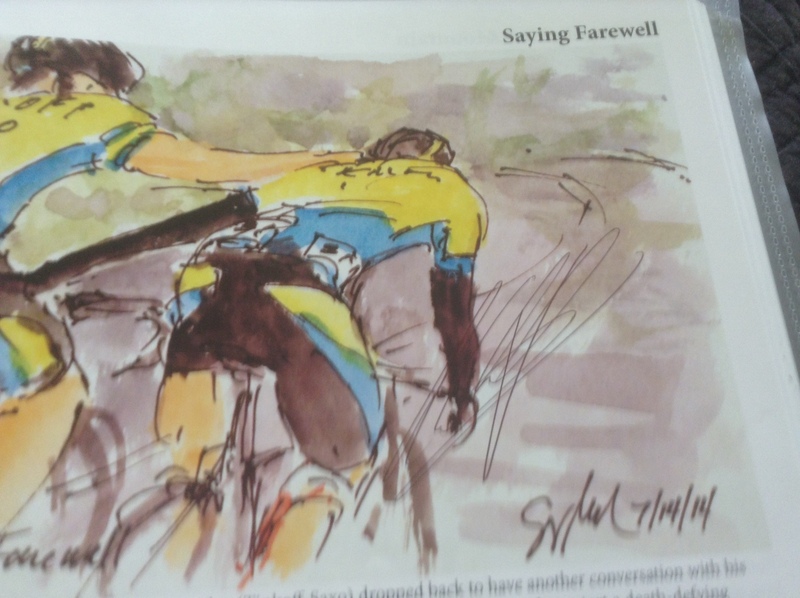 This one is from the Giro d’Italia and features its “god-mother” holding the splendid winner’s trophy. 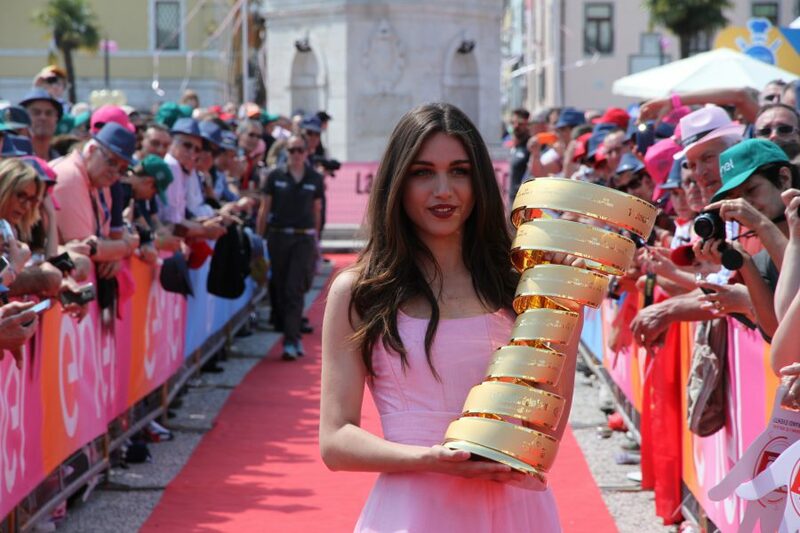 Hailing from Sardinia, the start for next year’s centenary Giro, Georgia Palmas, a former Miss Italy, runner-up in Miss World and star of a number of celebrity reality television shows, has graced the arms of a number of well-known Italian sporting stars, none of them cyclists. This photograph was taken in Palmanove, in northeastern Italy, where the old town was built in the shape of a star by the Venetians in the late 16th century. My beloved and I consider ourselves fortunate to often combine work with pleasure. 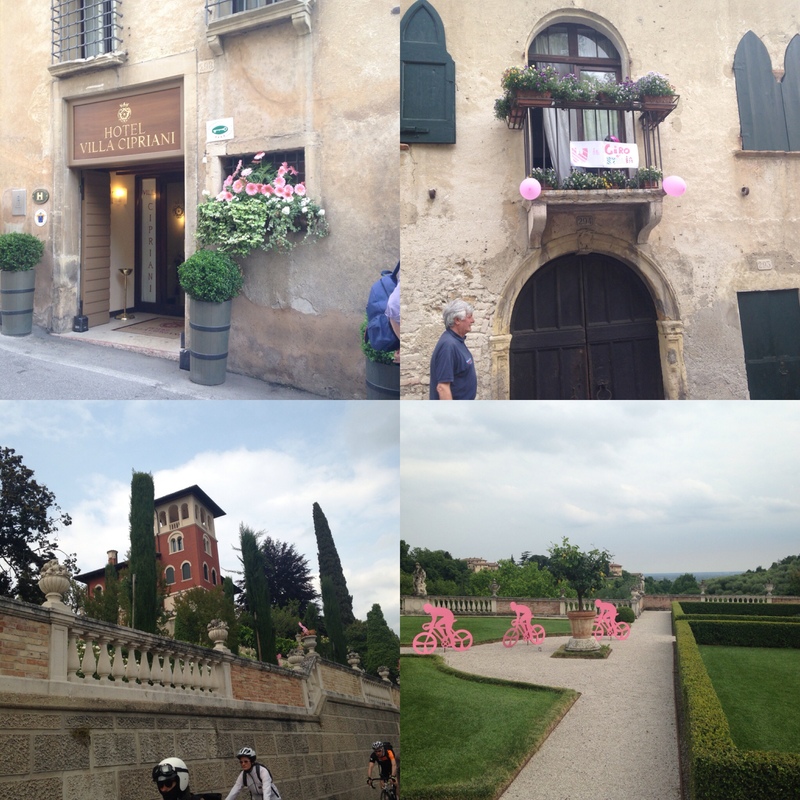 We spent the European mid-May Bank Holiday week-end in Tuscany watching the Giro d’Italia and cycling around the beautiful Tuscan countryside. Although typical wet Bank holiday weather was forecast, the weather was better than anticipated, with rain falling either overnight or just in the late afternoon. We stayed in a hotel we had first visited back in 2005 while spending time with one of my beloved’s German clients, who has a house in Chiantishire. 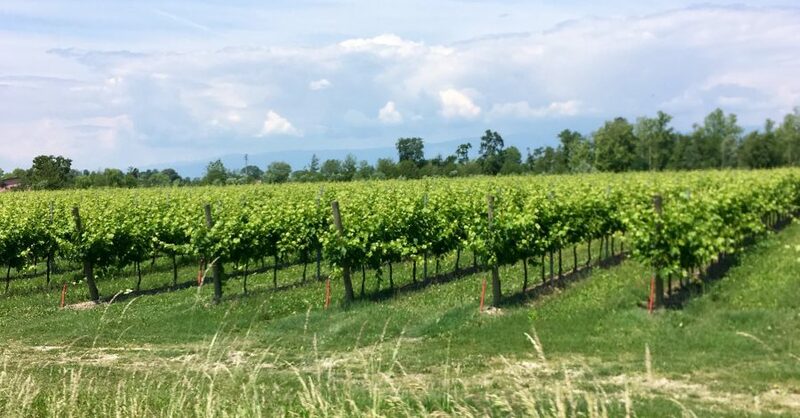 Over several subsequent trips to the region we’ve spent time in a number of Tuscan towns and have always been delighted with the food, wine and culture on offer plus the cycling, on undulating roads with little or no traffic, has been fantastic. 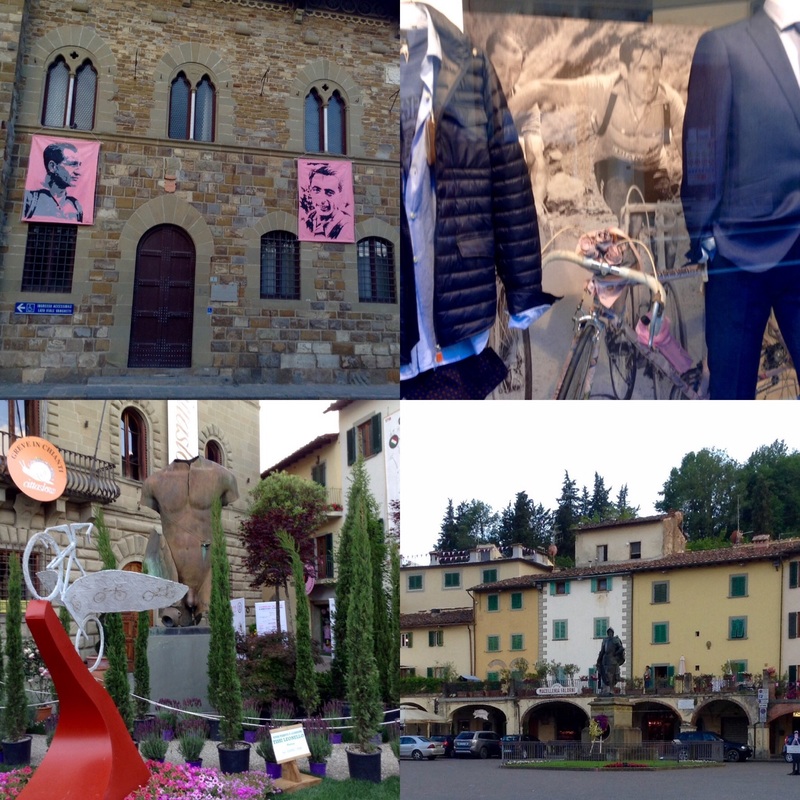 On Saturday, after a quick ride, we headed over to Arezzo, the finish town for stage 8 of the Giro d’Italia which included some of the (in)famous Strade Bianche. We made the mistake of steering clear of the motorway in preference to the country roads and found every which way was blocked by the race some 4km out of Arezzo. Undaunted we elected to walk only to discover later that the finish line was actually 8km away. Now I usually love a brisk walk but found this tougher than anticipated in the warm late afternoon sunshine. We arrived at the finish the same time as the tail-end Charlies. More significantly, we arrived at the Accreditation Centre seconds after it was supposed to close to discover everyone had packed up early and moved on. Neither of us could face the hike back to the car so we took a taxi. By this point in the proceedings, and having missed lunch, my beloved and I were both famished. On the way back we stopped off in the town where we’d stayed during the 2013 World Championships. Our good humours were revived with an Aperol Spritz at a nearby bar followed by dinner at an Osteria, both of which we’d previously frequented. The owner of the Osteria, who runs front of house, remembered us and his wife duly whipped up a truly delicious meal. Sated, we could finally laugh about our afternoon of mishaps. I slept well that night. After misfiring on Saturday, we had to collect our accreditation at the start of Sunday’s time-trial stage but this process wasn’t without its tribulations. I was fifth in the accreditation queue but those ahead of me hadn’t pre-registered. The convoluted process took over an hour, added to a further 30 minutes waiting for the accreditation staff to turn up. I managed to while away the time chatting to the other journos and former pro Paolo Longo Borghini, who’s now responsible for rider safety at the Giro, and part of RCS’s management team. Next up, and more importantly, I had to deliver my cakes to the respective teams before we headed to the finish in nearby Greve in Chianti with our wet weather gear. Yes, the sun was shining but we’d seen the weather forecast. 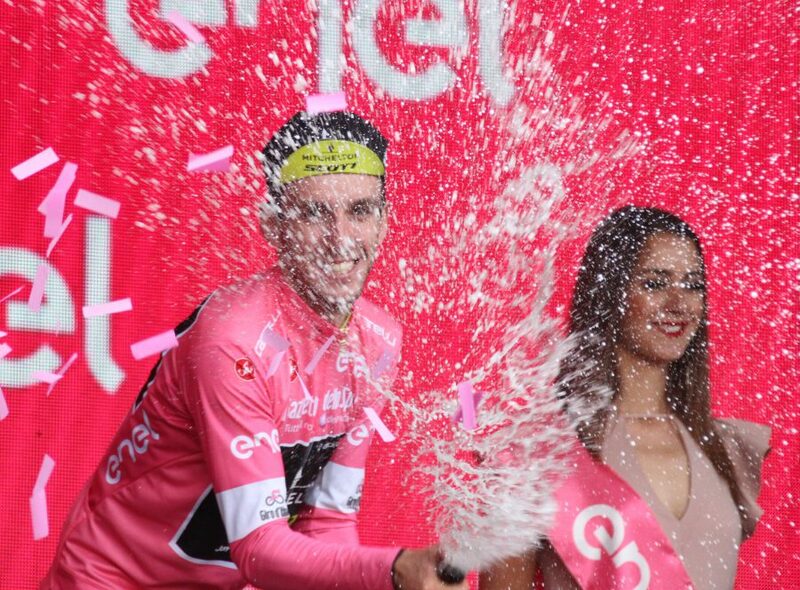 Most of the peloton would be getting a soaking. Monday’s rest day involved a recovery ride around the glorious Tuscan hills. We were fortunately back before the afternoon downpour and ate a superb meal in a nearby bar packed with locals. It was so filling we only needed an ice cream from the gelateria for dinner, where I was delighted to discover they did two flavours of vegan ice cream (coffee and raspberry) which, in the interests of research, I just had to try. 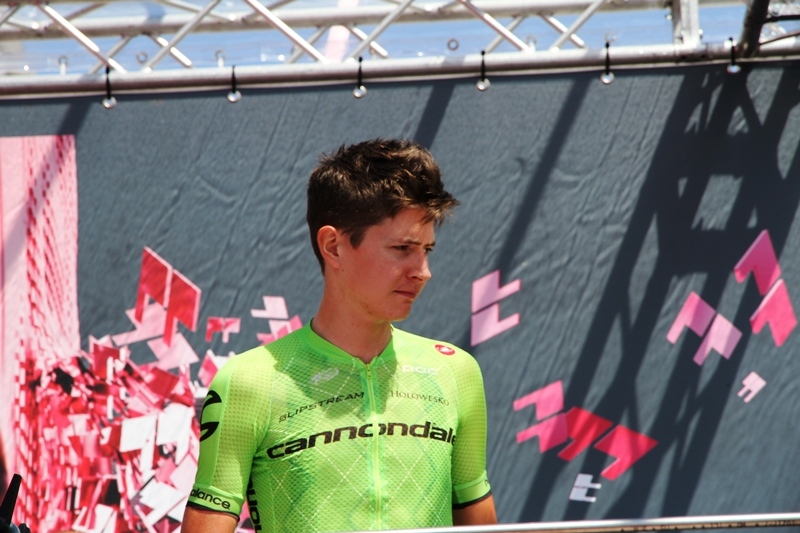 At the start of Tuesday’s stage in a suburb of Florence, we caught up with staff we know at Bardiani-CSF and evaluated their riders’ chances of a stage win. My parting comment was “I’ll keep my fingers crossed, who knows, today could be the one!” Prophetic or what? 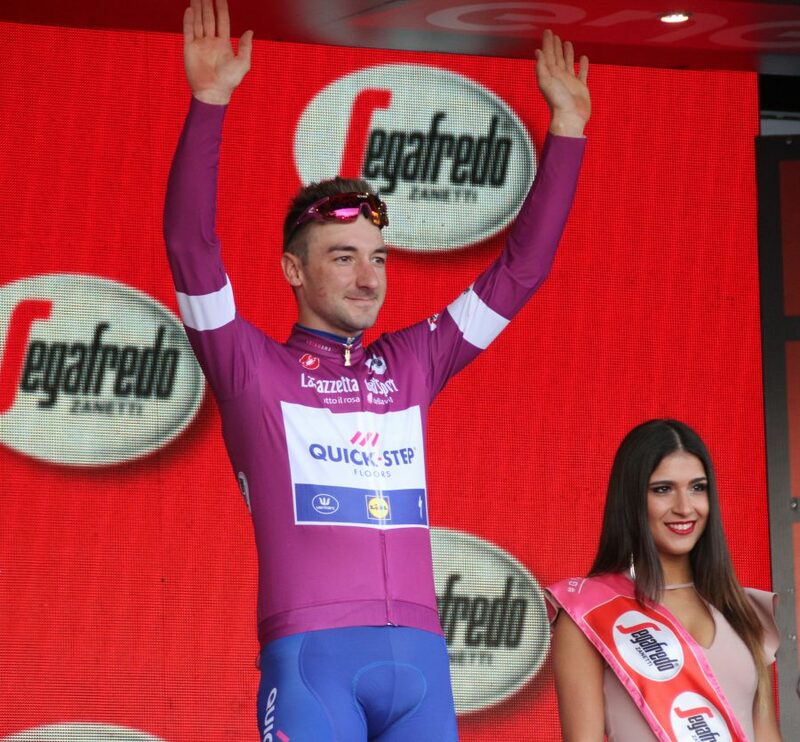 One of their promising neo-pros, Giulio Ciccone, won the stage. Impressed by my cakes, one of the Sky boys challenged me to come up with a bar for their musettes. They gave me one prepared by the wife of one of soigneurs. It was okay but rather dry and tasteless. I shall be working on it this week and will return to the final few stages with a much improved product, along with some of my brownies. @sdw14 @Ride_Argyle We smashed those brownies! After watching the peloton depart, we headed to a town we’d never before visited. 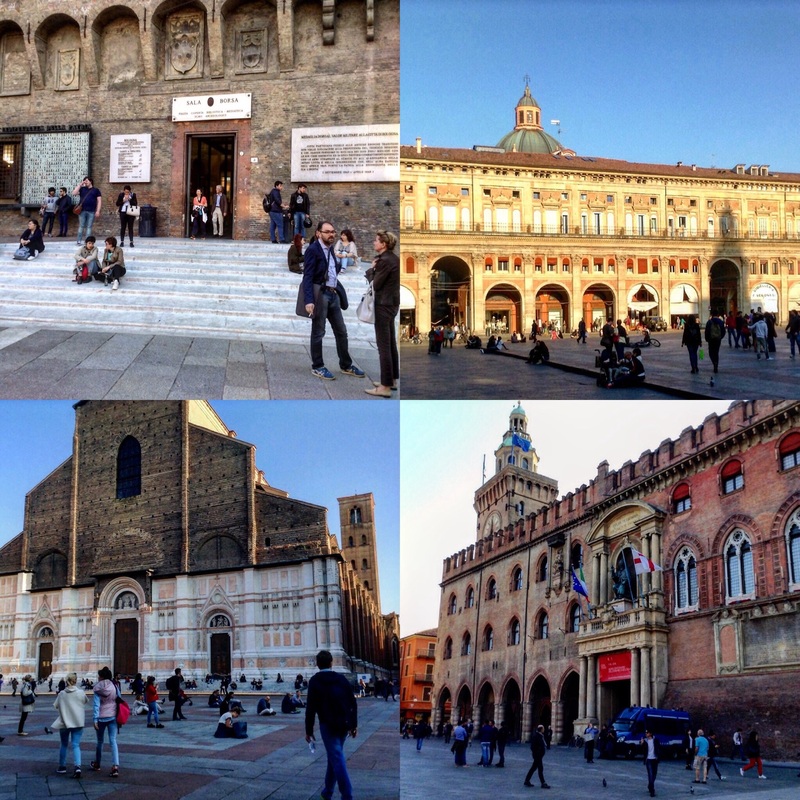 Yes, this was our maiden trip to Bologna, a town about which I had little or no expectations but it blew me away. We stayed in a delightful, modern, three-roomed bed and breakfast in the old town, just a short stroll from the main attractions. Before checking in, we had lunch in a restaurant nearby which had been in situ since 1957. If it’s lasted that long it’s got to be good – right? Absolutely! We enjoyed yet another magnificent meal in a family run neighbourhood institution. The owner had passed away in 2007 but his widow still helps out while the three children now run the restaurant. Much to my delight, the restaurant featured an old childhood favourite, the sweet trolley. I couldn’t indulge but my beloved had the house speciality Zuppa Inglesi. He proclaimed it “nice” but a pale imitation of my and my late mother’s rum soaked trifles. Then it was time to walk off those calories around the magnificent old town whose monuments are built almost exclusively of brick, many dating from the 14th century. Some of them are very tall, underlining how wealthy the city was in former times. The shops are under attractive stone porticoes which have beautiful frescoed ceilings and wrought iron lights, clocks and shop signs. This is one of the most beautiful cities in northern Italy and deserves to feature more prominently on tourists’ itineraries. I shall return particularly now I know how close it is to Mugello, home to last week-end’s Italian MotoGP. The following day we headed directly to the Giro stage finish in Asolo, the Pearl of Veneto, where one of my dearest friends lives. A fabulous cook, she whipped up a delicious feast for lunch which we enjoyed before watching the peloton stream through Asolo’s beautiful old town in dribs and drabs. Dinner at a local restaurant followed, before we headed to our hotel for the next few days in Pordenone. From time to time my beloved works with a company based here. We know the town well but haven’t visited for a while so it was good to renew our acquaintance with our favourite restaurants and watering holes. 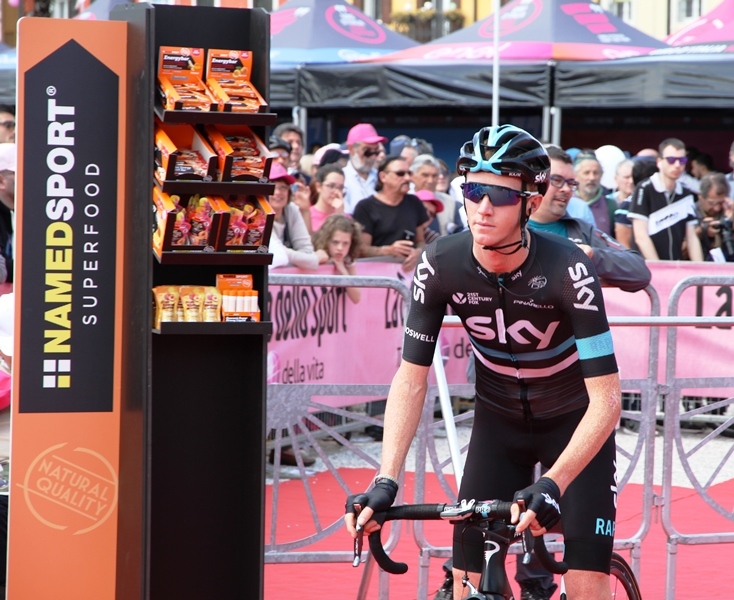 Thursday’s stage hugged the Venetian coastline though Wednesday’s warm sunshine had retreated behind clouds and heavy rain. We went to the stage start but when it’s pouring down with rain, it’s difficult to do much more than wave at the riders one knows. Understandably, no one wants to spend a moment longer than necessary in the inclement conditions. 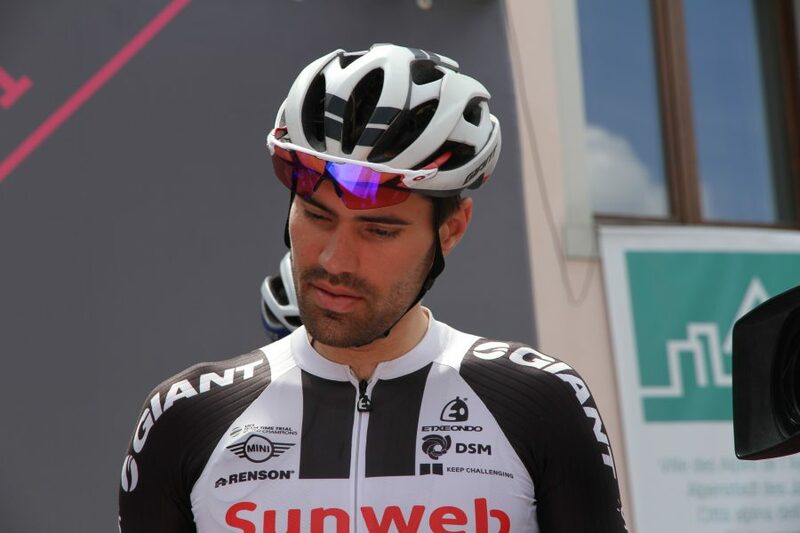 Friday’s stage started close to Udine in a medieval border town and fared better weather wise, though the boys were looking nervous as the stage heralded a triptych in the mountains before another difficult week ahead of the finish in Turin. I promised to return in the Southern Alps with more baked goods to see them through the penultimate day of climbing. 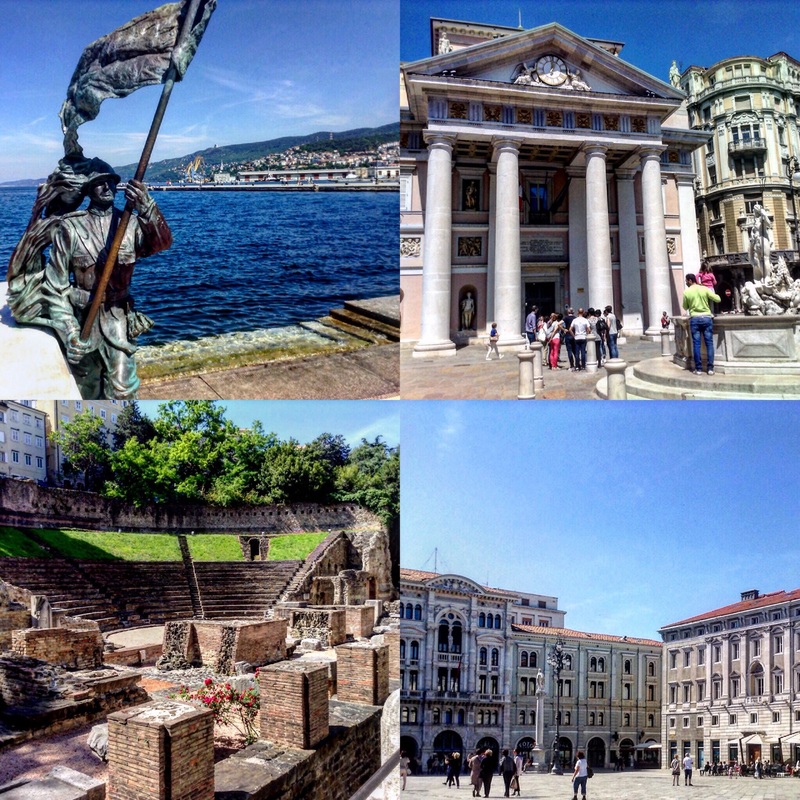 Saturday we headed to Trieste to meet with potential Slovenian clients. We’d briefly visited the city when the Giro d’Italia finished there in 2014 but hadn’t been able to have a good look around as we needed to get back for Cannondale’s farewell Giro party. It was good to get another opportunity to visit this fascinating town which still bears the influence of its former occupiers, the Austrians, on its buildings and cuisine. Sadly, I couldn’t find a cake shop doing vegan equivalents of any of the delicious Austrian treats. It was a great trip. The Giro is a beautiful race and I love the way the Italians embrace it by decking themselves, their children, pets and shops in pink. It’s much more an individual and not a community effort and, as you might expect, it’s generally done with great style and panache and much reverence for the Giro’s history. I consider myself fortunate to live only 45 minutes from the Italian border. Sunday, after the departure of my beloved on a 10-day trip to Thailand and Malaysia, I decided to bite the bullet. I needed a long, tiring ride. I set off in the company of two of my girlfriends who were riding part of the route with me. 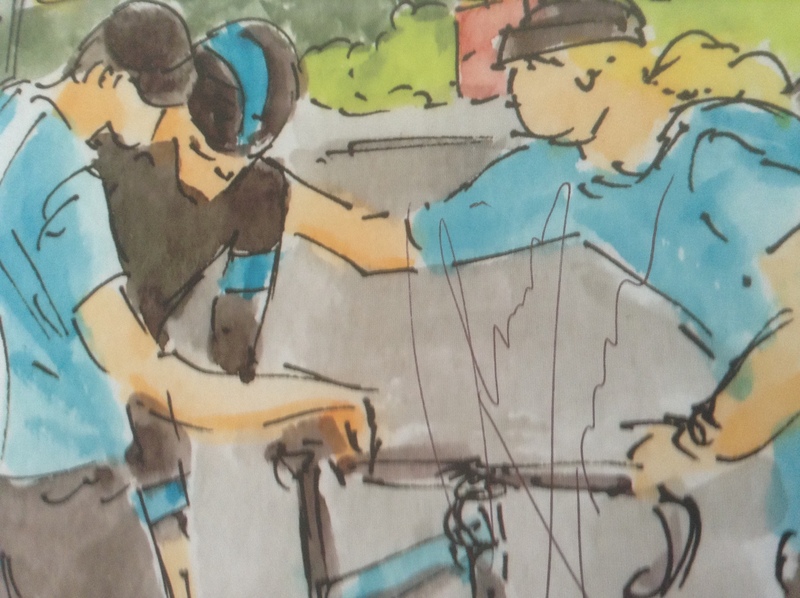 As I plodded along behind them, in the armchair seat, I realised I was feeling the effects of too many years, too many kilos and not enough kilometres. Something I need to address this summer. We broke our ride for a drink. They both had coffee but I needed the sugar hit of a cold coke to keep me going. We parted, they turned for home and I rode on. This is one of my all-time favourite rides, ridden in either direction, providing a not unduly testing terrain: 1500m of climbing over 85km. The weather, pressure of work, trips away without the bike and sheer laziness on my part means I’ve ridden less kilometres for the first part of this year than I have in the last three or four. The rot simply has to stop. 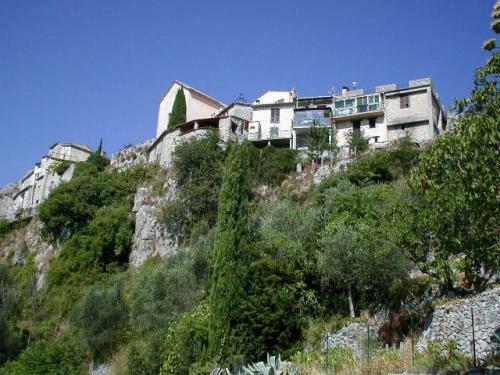 I needed another infusion of coke before tackling my favourite descent, the Col de Vence, where I clocked one of my fastest descents ever – those extra kilos again. From thereon it was downhill all the way until my final climb back to the Domaine where I was frankly on autopilot. No time to shower and change, the Dauphine transmission was about to start. I usually watch this in HD on the big screen in the office but for some reason, I couldn’t get it to switch on and ended up with a pirate feed that was at least 3km behind the live one! My previous really long ride had been on the Giro d’Italia’s first rest day – yes, that long ago – and was largely ridden on the flat while the rest of the time I have made do with a quick dash around some of my traditional short winter routes in between assignments. So I’ve got my training programme out, dialled it back a bit and have rides planned for the forthcoming week. I’m just praying the weather co-operates. The sky’s currently a brilliant azure blue and cloud-free. Let’s hope it’s finally here to stay. I’ve added a weekly ride up my favourite Col de Vence as my aim is to improve on my best time for the ascent from Vence. I’m also going to head over to the Col de la Madone on some week ends, it’s longer and more testing. Plus, there’s a couple of hills I’ve never gotten around to tackling, largely because I shouldn’t ride them on my own, I do need to ride them with my beloved. He, on the other hand, has signed up to ride the Tour team time-trial route as part of a four-man team which badly needs to get in some practice ahead of the challenge. Individually they’re all pretty good at time-trialling but it’s a very different matter holding it together as a team. The week end after their challenge I’m hoping to take part in the local Rapha Women’s 100 but my availability will depend on my friend who’s due to give birth that very week end. Her husband is likely to be away and I may be on call. 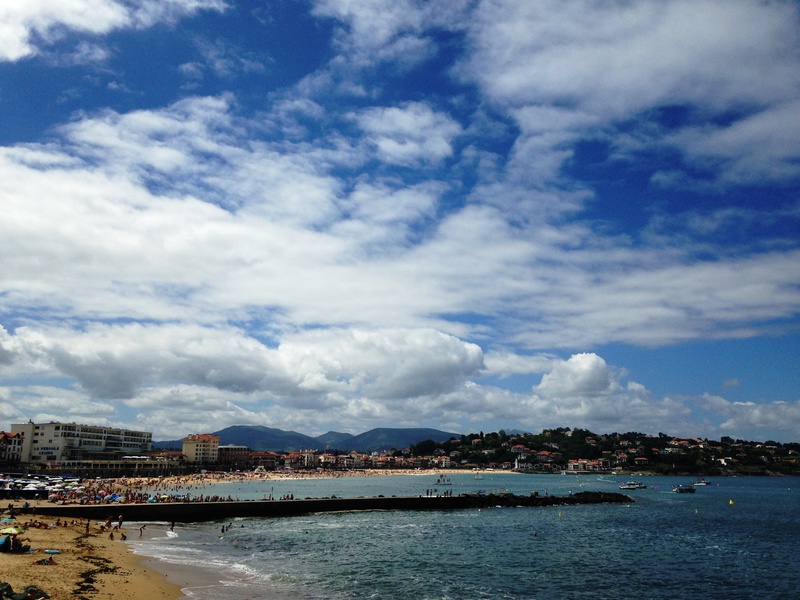 At the end of July my beloved will be putting me through my paces once more in the Basque country. Earlier in the year we found some great hilly climbs but couldn’t tackle them thanks to the driving rain and snow. I just know we’re going to be revisiting them. I’ll also be hoping to spend some more time with him in Italy which will give me an opportunity to ride in the Dolomites, following some of the parcours from this year’s Giro albeit in much better weather. So I have plenty of plans, I just need to stick to them.